Today I have a very exciting announcement and review. I will be reviewing one of my favorite products ever, one that I have used for over 8 years now. This is a product I fully and 100% stand behind and know for a fact works and changes your skin! Ready for the exciting part, the amazing people at the company MD Skincare (don't confuse with Skin MD) behind this product has sent me one for you! This company was founded by Dr. Dennis Gross. It is the famous Alpha Beta Daily Peel Pads, worth $75. I have lightly touched upon this product in my skin care post. Let me just review it a bit more for you. First of all, back in high school I had great skin, very clear but with occasional clogged pores. I also have very dry skin which is conducive to fine lines due to aging and the dryness. I was recommended this product by my facialist at a spa back at home on Long Island. It was a relatively new product when I first tried it but I fell in love with it. It now has gained a cult- like following! The Alpha Beta Daily Pads come in a tube with two containers within it. They containers house Step 1 and Step 2. The pads are to be used after you cleanse and tone. A little warning, do not use an exoliator the first few times before you use this product as it contains gentle acids and it might burn a little (a tiny but, like lemon juice). The first few times it will sting but that subsides after a few uses. After are prepped you take the pads in Step 1 and swipe all over your face and let sit for 1-2 minutes. After you take the Step 2 pads and clean your face with them, they are the neutralizing pads. You will not notice an immediate difference but when you wake up in the morning you will 100% percent feel that your skin is softer and smoother. After about a week you will 100% notice the increase in clarity and radiance. This product will truly alter your skin in tone, texture, radiance and clarity! I am a lifetime user of these pads and I hope the winner enjoys the prize! I would reccomend this product to any skin type, oily or dry, everyone can benefit froma smoother texture, less pores, clearer and more radiant skin! I happen to also have the Body Alpha Beta Pads, the only difference with these are the diameter of the pads. Therefore, you can use the face on your body and vice versa. 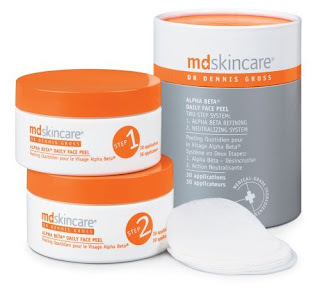 On to the give a way, you can win a 30 day supply of MD skincare Alpha Beta Daily Peel Pads worth $75. The requirement is that you must be a follower of this blog and comment why you want to win this product. You can increase your chances of winning and enter 2 additional ways. 1. If you follow me on Twitter you will be entered again. Follow me at BelleDuJourNYC on twitter. 2. If you re-tweet my Give-A-Way Tweet on twitter. The give a way will close on Feb 1st, I will pick the winner based on a random number generator and contact you for your address! Good luck to you all, this is a really fabulous prize! I have aging skin and this would help to give me a brighter healthier looking skin and right now I am not using anything real good for my skin. Trang tri noi that nếu chủ hộ là một người phù hợp khoảng không nhiều tông màu, chủ căn nhà có thể biến tấu noi that nha bep diện tích căn nhà bằng các sáng kiến sáng tạo trong bài viết này. sử dụng giấy dán tường trang hoàng giúp giảm giá thành đồng thời có thể biến tấu nhanh không đề nghị nhiều công nghệ, thời gian giống cách sơn tường cổ kính.Nhìn vào những hình ảnh liên quan đến việc phân bổ bình thường tiêu dùng hoa văn nhẹ mộc mạc. Có những bức tường được xếp đặt Tham khảo thêm dịch vụ thiet ke noi that - thiet ke nha hang - thiet ke noi that can ho - thiet ke noi that chung cu- thiet ke noi that van phong - nha dep 2016 - thiet ke noi that shop - thiet ke noi that showroom - thiet ke noi that phong ngu - thiet ke noi that phong khach đồ trang trí trong nhà say mê với giấy dán tường hoa văn bằng cách tận dụng gam màu xám thanh lịch thường thấy trong khách sạn, doanh nghiệp theo phong cách châu âu. Đó chính là tông màu trung lập và mềm mại. tiếp theo sau quy trình pha chế nội thất noi that phong khach , nền của những chỗ ngủ nghỉ được làm đẹp với hoa văn nhưng vẫn thanh thoát hoa văn dư thừa cho phòng ngủ thêm phần hài lòng. Một số style khách thường được nhiều kiến trúc sư đồ dùng trong nhà phòng ngủ sử dụng là sự kết nối lặp lại làm nổi bật nét đẹp chính của phần lớn căn phòng gồm cả noi that van phong còn được gọi cách khách là xếp đặt hình học của do go phong ngu . My skin has been a nightmare for just under a year now, and nothing seems to correct it. I think this might be my last hope for a miracle cure! Well truth is im not that young anymore lol im aging and i am starting to notice dryness and fine lines that i would love to attack now! My skin needs more radiance- these last days I fear of wearing bright pink lipstick because it just emphasizes my dull-olive-greenish skin! Hello! Enter me please - I am always up for trying new skincare, and my skin really could do with a boost at the moment with the terrible weather and exam stress!! I would love to try this product and brand - as I have never tried anything from this brand, nor this type of product. I feel that my skin is going under a change at the moment from oily/combo to more dry and I think I need something to give it a helping hand in keeping it clear, helping my skin to be better prepared for the aging process - and maintenance is the key. Anyways - thanks for posting this giveaway! A fan of your blog! Hi, I would really really like to try this product. Over the past couple of months or so my skin has gone completely haywire, breakouts and dry patches all over the place! Been trying so many different skin care combinations to try and sort it all out, and its only just calming down. Been so depressed about my skin recently so anything that may help (this product perhaps), would be a blessing! I would love to try this product, I just finished a course of accutane and I'd love to now re-fresh and re-surface my skin with this! I have oily/acne-prone skin and I have enlarged pores. This would really be helpful to improve my skin's appearance! I sent a request to follow you on twitter as nina0205. I've never tried anything from this brand,and I'd love to! Also sent a request on twitter as Angelica1405. Sounds like such a great product! I'd love to try it, I have oily skin and consequently always struggle with clogged pores and uneven skin texture. I, like you, used to have great skin in high school. As I moved through college I started randomly breaking out. Now that I'm 24, I tend to suffer from large breakouts which leave my pores looking huuuuggee! This product sounds like it may work miracles for me!! I have aging sking and I am still battling large pores on my nose. I think this would work wonderful with my skin type. Since high school i have terrible bad skin of my face and now im going 34 and still not happy the way the surface of my face. I hope i will win this product so i can try it and make a miracle for my skin. I usually want to try everything you review and this is no exception! I am new to your blog and I love it. I am from SF and lucky enough to come to NYC at least once a year since my husband is from NJ and we try to visit his family there yearly. I have conformed and give in to Twitter by starting an account and with this give away it makes me very happy to be on there now. Well that and following the likes of Roger Ebert and Dita Von Teese! at 28 years old my skin is at its worst. i don't know what to do anymore.